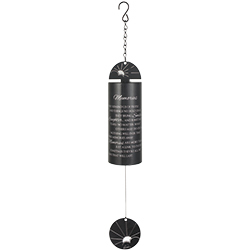 22″ Memory Bell .” They remind us of people and things we hold dear, they bring smiles laughter and sometimes tears. No matter what others do or may say, nothing will take these memories away. Memories are more than a link to the past, sometimes they’re all that we have that will last.” Online ordering is for shipping to a family’s home. Please let us know in the “notes” section in checkout how you would like your card to read. For local delivery to a funeral home, you will need to purchase a stand $20. Comes with complimentary flowers and a bow.